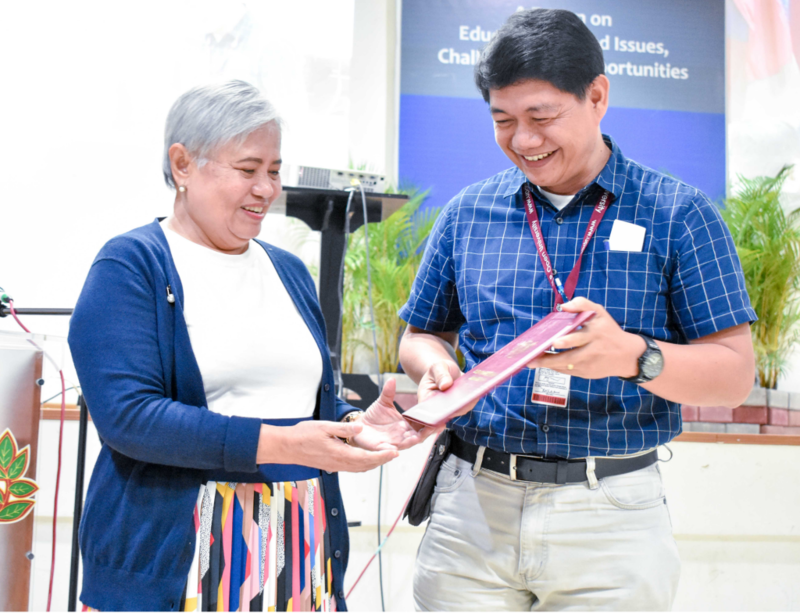 The Faculty of Education (FEd) of the University of the Philippines Open University (UPOU) spearheaded the sixth installment to its EDUKussion Forum Series, an event that aims to present and discuss education-related issues, challenges and opportunities. Held last 22 June 2018 at the Centennial Center for Digital Learning (CCDL), UPOU Headquarters, Los Baños, Laguna, the forum talked about “Integrating Literacy Strategies across the Curriculum”. 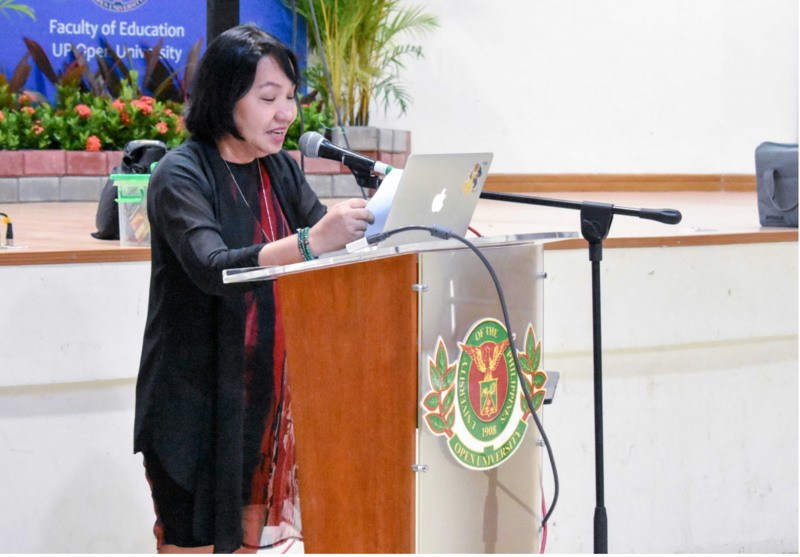 Dr. Nemah N. Hermosa, a retired University of the Philippines professor specializing in digital literacy instruction and language and literacy education, shared her expertise on how enhanced literacy initiatives can be blended in the present basic education curricula. Dr. Hermosa also served terms as the UPOU FEd Dean and UPOU Vice Chancellor for Academic Affairs. Students and teachers from basic and higher education institutions, mostly from Laguna, physically and virtually attended the forum. Asst. Prof. Ana Katrina T. Marcial moderated the program flow and open forum. Dr. Melinda dP. Bandalaria, UPOU Chancellor, opened the EDUKussion Forum with citing special reasons why giving opening remarks is a pleasure, especially for the event itself. First off, Dr. Bandalaria congratulated UPOU FEd for their efforts in initiating and continuously organizing learning events despite the amount of teaching and work load at hand. Dr. Bandalaria also mentioned that the use of literacy strategies is not limited to those in the education practice, and that the topic would be beneficial to a wide range of people and groups. She also shared anecdotes of recent interactions with former UPOU students, and their good experiences of having Dr. Hermosa as their teacher. Dr. Bandalaria capped off her speech by encouraging the audience to “share the ride” with Dr. Hermosa as the “pilot” and anticipate a fruitful forum. UPOU Chancellor Melinda dP. Bandalaria shares reasons she enjoys giving Opening Remarks. Dr. Hermosa opened her speech by distinguishing paradigms and contrasting content area literacy (CAL) and disciplinary literacy (DL) strategies. Although both literacy strategies depend on the use of texts to assist students in mastering the subject matter, Dr. Hermosa noted that “the difference, however, depends on teachers using those texts to focus on either what students are learning or how they are learning it”. For each discipline, students need to learn (1) the vocabularies related to that area; (2) how to read and understand its texts; (3) how to communicate knowledge and ideas in proper means; and (4) how to listen and read critically, assessing the value of what they hear and read. Overall, Dr. Hermosa suggested that having an integrated curriculum entails teaching literacy strategies across the different subject areas. If not feasible, there must be at least collaboration among language and content area teachers, so that students can further retain and practice the lessons learned. DIGITAL LITERACY INSTRUCTION AND LANGUAGE AND LITERACY EDUCATION EXPERT. Dr. Nemah N. Hermosa highlighted that teachers must be conscious of integrating literacy strategies in all subject areas for students to be able to understand lessons more. Dr. Hermosa also reminded teachers to consider different factors—meaning, structure, knowledge, and language, among others—when deciding the complexity of the text in their teaching materials. Teachers must also think about text complexity with relation to their students. For struggling readers, “scaffolds should enable students to experience the text through more teacher assistance, rather than avoid the complexity of text,” reflected Dr. Hermosa. This also implies that teachers need to (1) know their students as readers; (2) understand the complexity of the texts; and (3) use a range of instructional strategies flexibly. Throughout her speech, Dr. Hermosa underlined the importance of using various reading materials, such as trade books and digital texts, related to the content area to supplement required texts. She constantly shared book titles and audio-visual samples from her learning resources collection during the talk, and encouraged the audience to also collate materials and gather their own set. However, Dr. Hermosa also remarked that caution must be observed when selecting children’s literature for use as supplementary reading material. She prompted the audience to always check if the material is accurate, appropriate for the readers, and understandable. 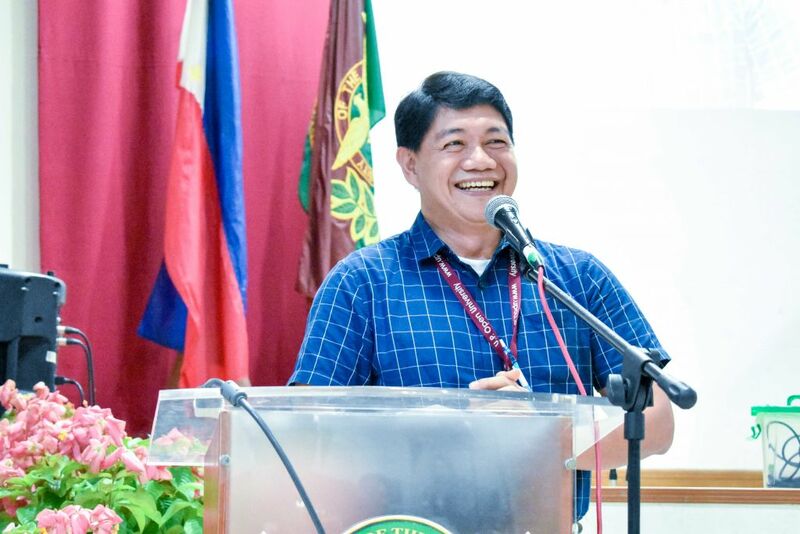 The open forum succeeded Dr. Hermosa’s lecture, and both physical and online participants raised questions and shared insights regarding the talk. Educators share their inquiries and thoughts during the Open Forum. Online viewers also participated in the event via UPOU Networks live stream. One of the audience members joining the event via live stream inquired about opportunities that teachers can provide for the students regarding making sense of the teaching content if the English Language Arts standards are not yet in the K to 12 curriculum. 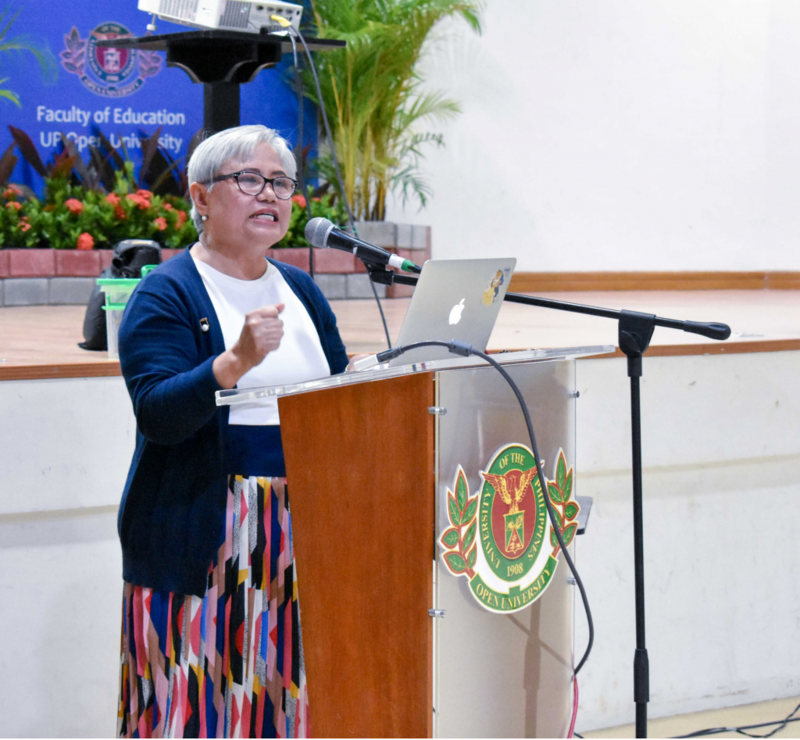 Since the Philippine education curriculum is a work in progress, Dr. Hermosa encouraged teachers to be proactive instead of waiting for the curriculum to be revised. “When we understand that the text is complex and that our students struggle, […] the teachers should [rather] ask the question, ‘What then can I do,’” she replied. Next steps involve examining text complexity and providing learning scaffolds and strategies for students to better understand the texts. Another inquiry that came from the floor was about tested methods on involving the community in teaching literacy to students. Dr. Hermosa suggested letting students explore the world outside the classroom and interview people and experts who are knowledgeable and practically experienced in the topic being discussed. Doing so will lessen the chance of parents being the ones doing the assignment, since the activities become evidence-based. Although the school has to secure permissions and insurances for the students, such culminating activities become avenues for students to speak with others, ask questions, and synthesize findings. UPOU FEd Dean Ricardo T. Bagarinao urges the forum participants to nurture the sense of nationalism and loyalty in today’s youth by further advocating literacy strategies across the curriculum. Dr. Ricardo T. Bagarinao, UPOU FEd Dean, ended the event by mentioning that the EDUKussion Forum Series is FEd’s contribution to the UPOU Flagship Programs, “making information of the University more accessible to our stakeholders”. He emphasized that the forum is an important venue to share teachers’ thoughts and experiences that could help improve the country’s education so that it can produce students who are better and more functional citizens. Dr. Bagarinao closed the forum with the hope that what Dr. Hermosa has shared will motivate the audience, not on how to pass the box, but to think of how to solve the challenges that the students nowadays are facing.